If you follow me over on Instagram, you probably know that a couple of months ago I cut gluten from my diet. The following thoughts are completely my opinion and something I’ve been thinking about a lot since going gluten-free, as well as returning from Iceland. Gluten is a feared ingredient in American culture. It feels like we, Americans, are constantly searching for an ingredient to blame for all our health woes, and lately that ingredient is gluten. I cringe at the marketing used on many gluten-free products, proclaiming that a food product is somehow healthier or superior simply because a gluten-based grain isn’t used. This kind of marketing leads consumers to believe that all gluten must be evil and “unhealthy.” Many of these gluten-free products are made with less-than-desirable ingredients, too. This reminds me of the margarine versus butter trend of my childhood. Don’t eat this food; instead, eat this highly processed food product. Demonizing ingredients, and then creating alternative (processed) foods, is a big money maker. Now, I’m not saying that eliminating gluten isn’t necessary. Some folks have a severe intolerance to gluten. And some folks may need to remove gluten temporarily to heal the gut and balance the body (overly-processed food and stress wreak havoc in our gut and our bodies). These circumstances aren’t trendy; they’re real issues that need to be addressed. My concern is more so for people who can consume gluten, but due to marketing and books and online influencers become fearful of all gluten. And on that note, doesn’t it feel like we live in a culture that’s constantly telling us to fear food because it’s from an animal or a recipe calls for dairy, or it’s not keto or paleo, etc? What happened to simply enjoying fresh, real food? In general, as a society, we consume a lot of gluten in highly-processed forms. Instead of demonizing gluten, I think it’s time that we take a look at how we eat gluten versus lumping all gluten together in the same bread basket (so to speak). It’s time to return to traditional methods used to prepare gluten-containing grains: sourdough (a traditional process that breaks down gluten and makes it easier to digest), sprouted grains (another traditional method that makes gluten easier to digest), and consuming a variety of wholesome grains (einkorn, spelt, rye, kamut, etc.). It’s also time for us to get back in our kitchens, and learn the art of preparing meals, including grains, in order to avoid the highly-processed food products that claim to be bread or pastries. It was fascinating to watch the food culture in Iceland during our recent visit to the country. I only saw a gluten-free reference once on a menu, and that was in a tourist restaurant. The Icelandic diet is rooted in tradition and sustainability. Bread is served everywhere in Iceland, and it isn’t a highly-processed bread-like product. Oh no. I’m talking about fresh, homemade bread using a variety of grains. Many of the breads we encountered were also made with traditional methods, including sourdough. The ingredients in all the breads, from pastries to basic table bread, are simple and wholesome. The breads aren’t made with stabilizers, gums, or preservatives. The ingredients are lovingly tended to and kneaded in home kitchens, small bakeries, and local cafes and restaurants. 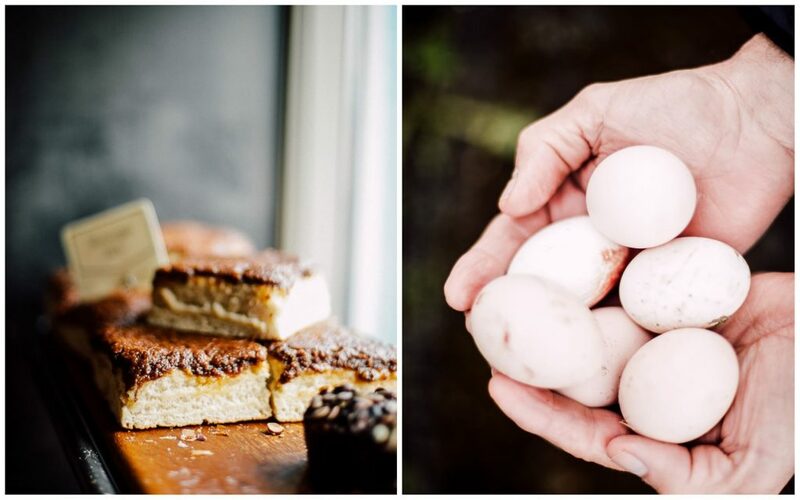 Bread is certainly a staple in Iceland, but it’s only part of a richer food culture that’s rooted in traditional eating. The Icelandic diet also consists of pickled and fermented foods, local lamb and fish (such as: trout and salmon), vegetables from local greenhouses (remember, it’s freezing cold most of the year), fruits, eggs, dried seaweed and moss, and a variety of dairy products that are produced locally throughout the country (skyr is the famous Icelandic yogurt). Americans (myself included) can learn so much from countries (like Iceland) that are rooted in rich, traditional, mostly-local food cultures. Where, for the most part, (real) traditional foods guide families; not commercial marketing or trends. Why did I go gluten-free over the past couple of months? Well, I went to a functional medicine doctor to have lab work done for a routine physical. One of the tests I took was a GI test. The results were incredibly detailed. Seriously impressive! My test revealed that a couple of parasites were living with me. I know, TMI, but apparently this is a very common issue. The test also revealed how my gut is handling gluten, eggs, dairy, and soy. The results were negative (a good thing) for each one, except gluten and soy. This means that some healing needed to be done. These reactions were signs that my body needed some extra TLC. That something was off balance, and, as a result, my body wasn’t processing certain foods well. Based on the results, my doctor put me on a gut-healing protocol for three months which included a bunch of gut-healing supplements, a gluten-free diet, and learning to manage stress (my cortisol levels were also high). I appreciated the fact that my doctor didn’t demonize gluten. 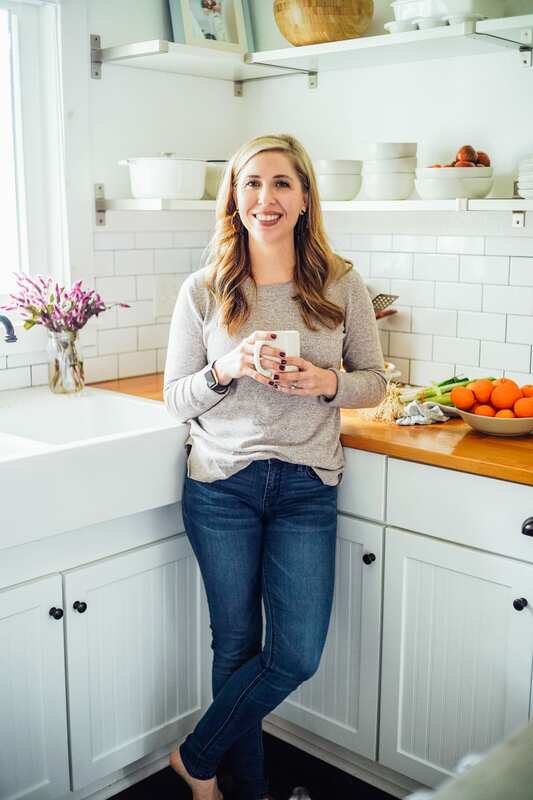 Instead, she told me that consuming traditionally prepared grains, along with ancient grains, is the best way to enjoy gluten–if your gut is happy and functioning well. This is how past generations enjoyed gluten and digested it with ease. Once the protocol is complete, I plan to add ancient grains and traditionally prepared grains back into my diet. <–Which I actually did in Iceland because it would have been nearly impossible to live in the country without consuming gluten grains. 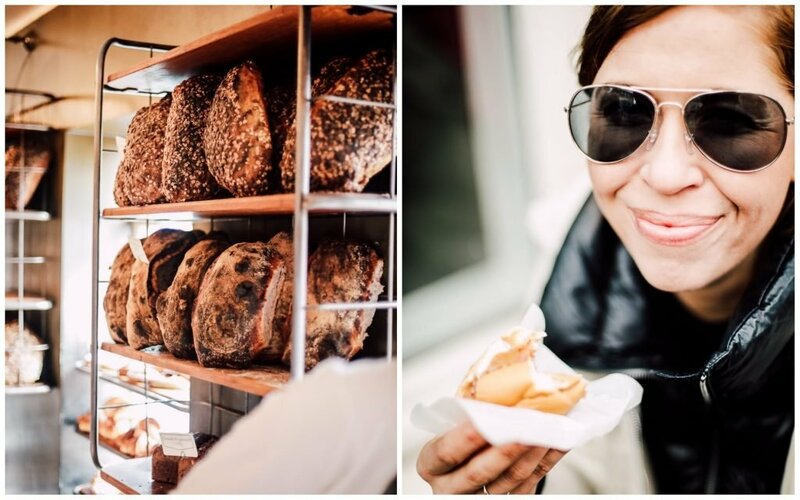 These experiences (my test results, healing protocol, and our recent trip to Iceland) have only deepened my passion for sharing the importance of getting back to a variety of ancient grains, as well as traditionally-prepared grains, such as: sourdough and sprouting. And, of course, the importance of enjoying a variety of real, traditional food (cultured, fermented, and fresh ingredients). Balance and variety is so important. 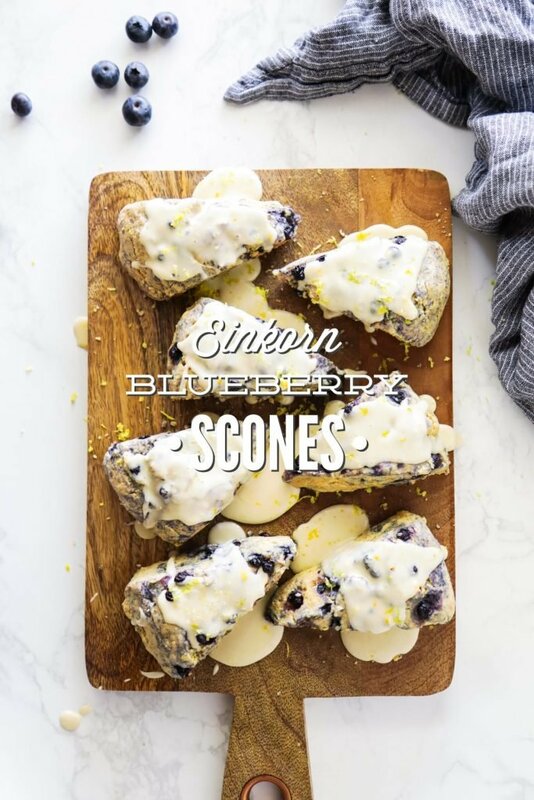 Today’s recipe, Einkorn Blueberry Scones, is made with an ancient grain, einkorn. Einkorn is known as the oldest variety of wheat making it an “ancient” grain. The ancient grain is believed to have originated in the Tigris-Euphrates region and is possibly the main grain referenced in the earliest accounts of the Bible. Einkorn is said to be the wheat men were eating in the earliest days before modern day wheat varieties. While modern wheat has undergone hybridization, einkorn still holds true to its original properties. Einkorn is slowly gaining popularity, but is still grown in only a few regions in Europe. The sweet, ancient grain has a lighter texture and taste than modern day wheat, and contains a more favorable gluten ratio. The scones make for a fun treat on the weekend, or for a special occasion. The scones aren’t overly-sweet, so the lemon glaze adds an extra touch of sweetness to balance everything out. 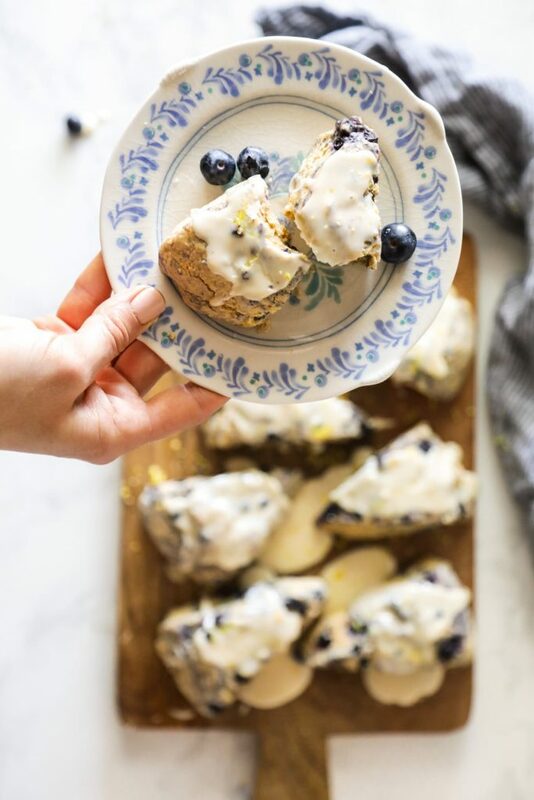 Homemade blueberry scones made with einkorn flour and naturally sweetened with maple syrup. The main sweetness and flavor comes from the lemon glaze, so don't skip it. 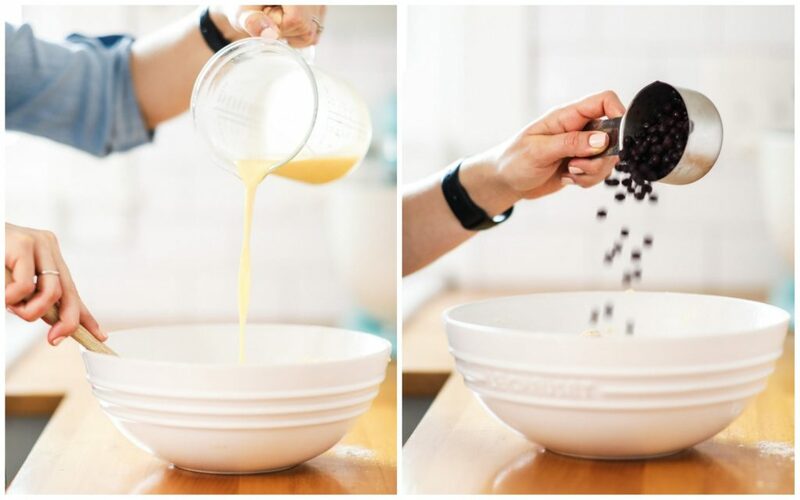 Whisk all the dry ingredients in a large mixing bowl. Cut in the butter with a pastry cutter or two knives, until it resembles coarse crumbs. 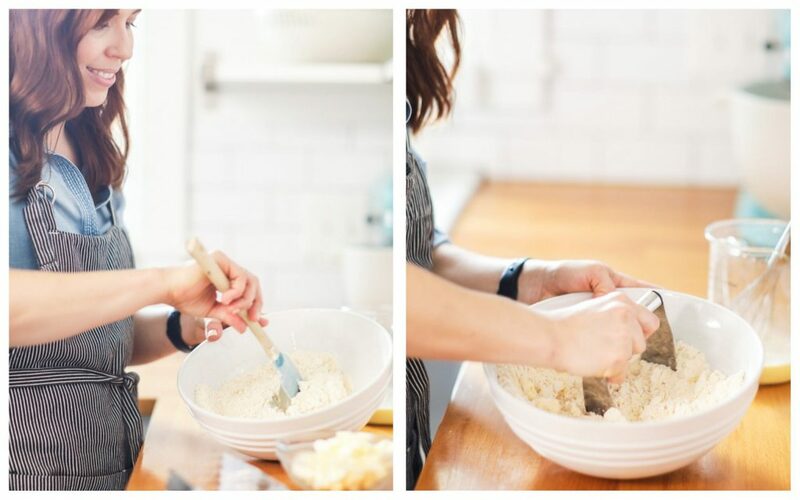 Whisk the wet ingredients in a small bowl, then add to the dry ingredients. 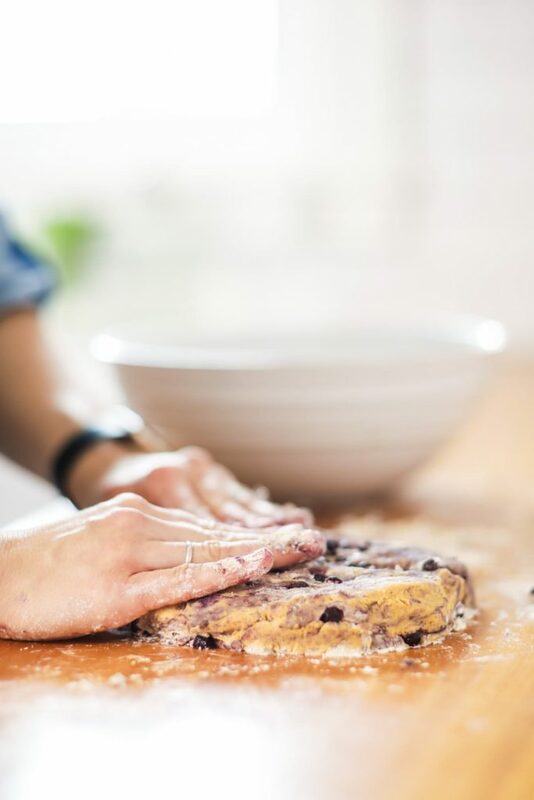 Stir the wet and dry ingredients together with a wood spoon, and then finish kneading with your hands to bring the dough together. All ingredients should be combined, but do not over-work the dough. Working quickly, knead the frozen berries into the dough. Some of the berries may not incorporate. Turn the dough onto a floured surface and form into a circle that is 1” thick. Cut the circle into 8 equal triangles. 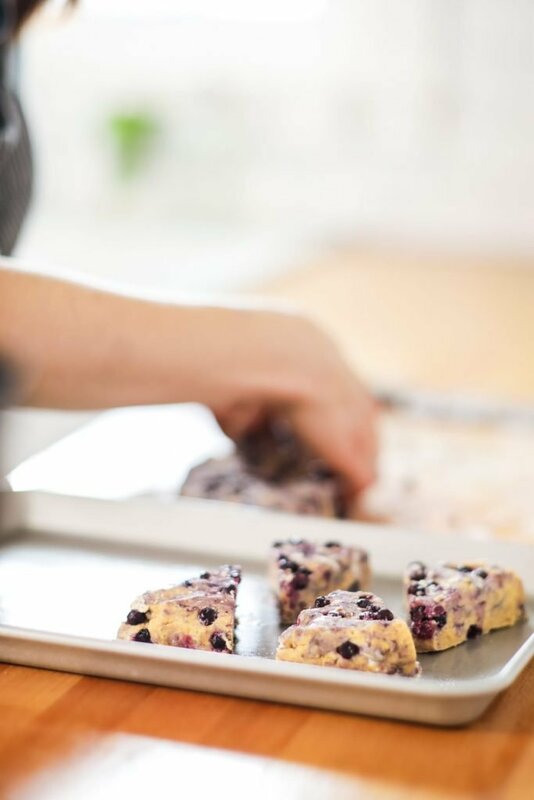 Place the scones on a parchment lined baking sheet--a metal spatula helps lift the scones from the floured surface. 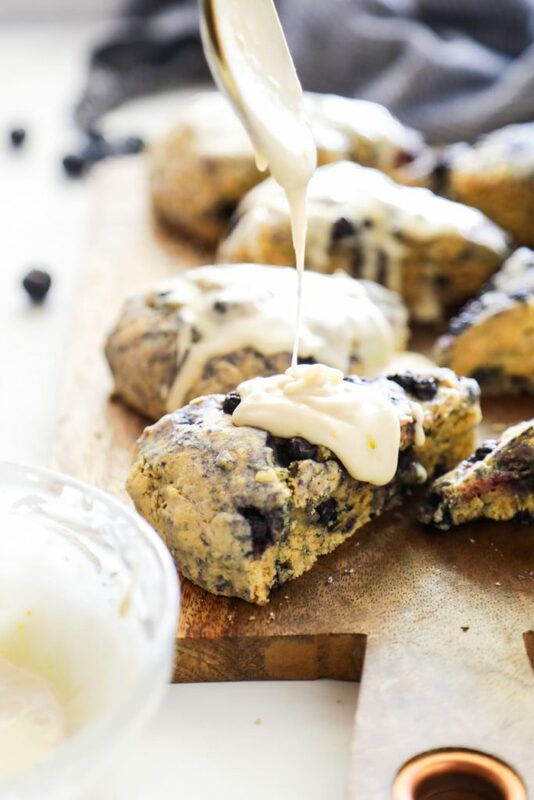 Press any remaining blueberries into the tops of the scones. Bake for 20-25 minutes, or until lightly golden around the edges. Let cool on the baking sheet for 5 minutes before removing to a rack to cool completely. Spread or drizzle the glaze over the baked scones once the desired consistency is reached. *Wild blueberries are smaller than “normal” blueberries. Most stores sell a wild blueberry option in the frozen fruit section. You could definitely try fresh or “regular” frozen berries, however, I can’t speak to this with experience. The key to making good scones is to work with the dough as little as possible. Don’t over-knead or over-mix. 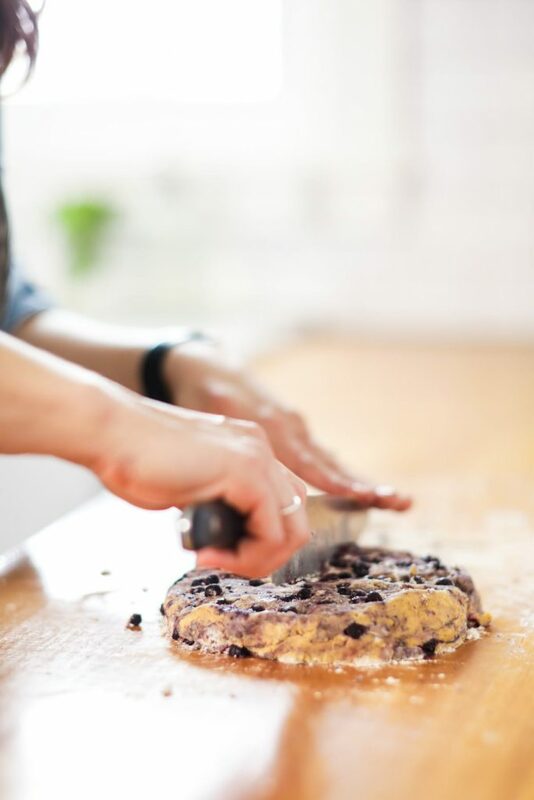 Keep in mind it is very difficult to knead all the berries into the dough. It helps to press a well into the dough, in the bowl, and pour the berries in, then fold it over a few times. Just be gentle. There will be some berry “bleeding” in the dough. This is fine and normal, and delicious. Pressing the uncooperative berries into the top of the formed circle also works. I commented on Instagram but will share here too. I have been LCHF for about 2.5 years. Now that I’ve got better gut health I’m looking for more of a balance rather than cut out certain foods. This article has helped me tremendously! I was about to give up because it’s not entirely sustainable for my family (others do great but not us). Thank you for this encouragement!! Hey Melynda, I’m so glad it was helpful! I actually wrote the bulk of that post before we left for our trip, meaning to share it while we traveled. But due to a security issue and being overseas, I couldn’t access my site for our entire trip. I think all that was meant to be. Because experiencing their food culture only helped solidify the thoughts on traditional eating ❤️. Totally agree—very well said! I look forward to making these scones. Loved your view on gluten! Yes, so true, Dena! Thank you for sharing! Have you tested these with the whole einkorn flour? I hate to have all the nutrients from the bran and the germ removed to make the all-purpose. Plus, the whole einkorn flour is so delicious! Hey Sarah, I haven’t. My guess is you would need less flour. 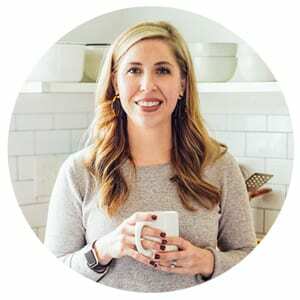 Here’s a helpful Q&A from Jovial about this subject: https://cookbook.jovialfoods.com/substituting-einkorn-whole-grain-flour-for-einkorn-all-purpose-flour/. Let me know if you try it! Any recommendations for substitute of the heavy cream for someone that has a dairy allergy? Almond milk, etc. Thank you so much for this recipe!! I’m a distributor for Young Living, and they recently released Einkorn Berries as a product. I’m SOOO excited to grind mine up into flour and make these scones!!! THANK YOU!! Keep in mind that would be whole wheat and not all-purpose and may act differently. We generally only test the recipes with all-purpose einkorn flour so would love to hear how it turns out! Hey Kristine, I think you’ll love einkorn. Ditto what Helen said. And usually freshly ground flour requires some adjustment in recipes. 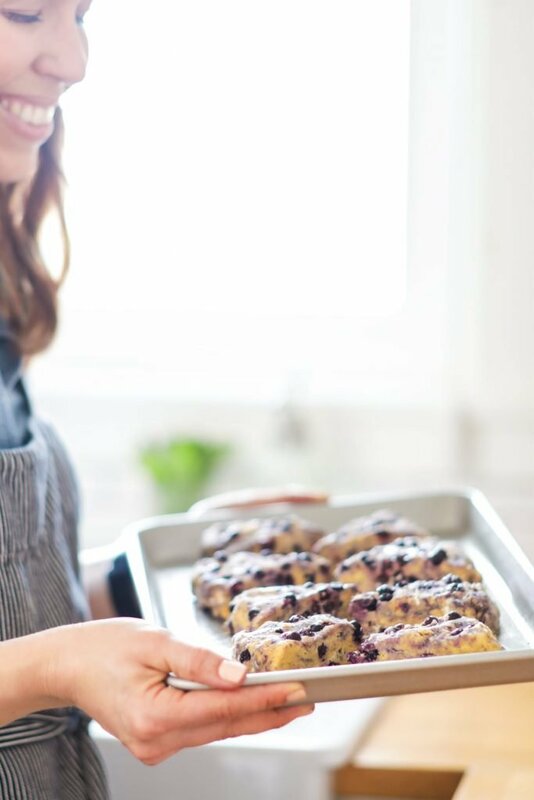 If you choose to go with the freshly grown berries, you may need to decrease the amount of flour slightly. Jovial has great information online about working with einkorn. Here’s their suggestion: https://cookbook.jovialfoods.com/substituting-einkorn-whole-grain-flour-for-einkorn-all-purpose-flour/. You just can’t beat the blueberry lemon flavor combo! Made these yesterday and will continue to make them over and over. Satisfies the sweet tooth every time. Thanks for a great recipe! So glad you’re enjoying them, Noel! Ireland and Scotland are the same. Lots of breads, fresh, local ingredients, and a strong emphasis on quality control. I don’t usually do dairy, soy, or bread due to gut discomfort, but I didn’t have a single problem while we were there. 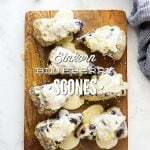 Trying these scones tonight!